Keolis took over in July, vowing to improve things. We’re still waiting. Here are 6 fixes. 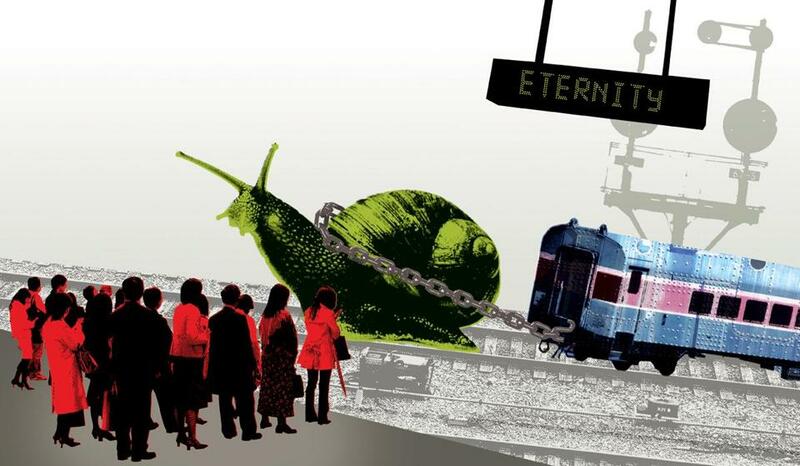 IF THERE’S a nightmare for Boston rail commuters, it’s the Fitchburg line. Trains between Boston and Fitchburg were on schedule only 66 percent of the time in November, worse than any other line. Even so, when word comes over Corey Lynch’s two-way radio that a truck has rolled over in Concord, blocking the rail on this particular January day, Lynch grimaces. “This service disruption will ding us,” says Lynch, who is deputy director of railroad operations at the Massachusetts Bay Transportation Authority. A rollover means the 1:15 p.m. from Boston to Fitchburg might wind up 40 or 50 minutes late, depending on how long it takes to get the truck cleared. Even without truck rollovers gumming things up, Keolis, the new operator of the commuter rail, has had a rough time of it these last few months, unable to live up to promises that it would do better than its predecessor. Keolis is a unit of the French national railroad that operates commuter trains in a number of countries, notably its own France and the United Kingdom, as well as the Virginia Railway Express into Washington, D.C. It took over our system on July 1, after bidding $250 million less over twelve years than the previous operator, the Massachusetts Bay Commuter Railroad, which had held the contract since 2003. Massachusetts Bay filed suit against the state for choosing Keolis, saying the company’s proposal was “misleading” and dangled false promises. One executive called the MBTA’s handling of the process “worse than galling.” A judge tossed the suit last April, basically telling the company to take its sour grapes and ferment them. The serial service interruptions have seemed abrupt and inexplicable, but trace, in fact, to choices made and choices avoided over decades. So far, though, Keolis hasn’t kept its most important promise to commuters: making the trains run on time. Keolis’s performance can’t be compared directly with its predecessor’s; acts of God like truck rollovers didn’t count against Massachusetts Bay’s on-time record. 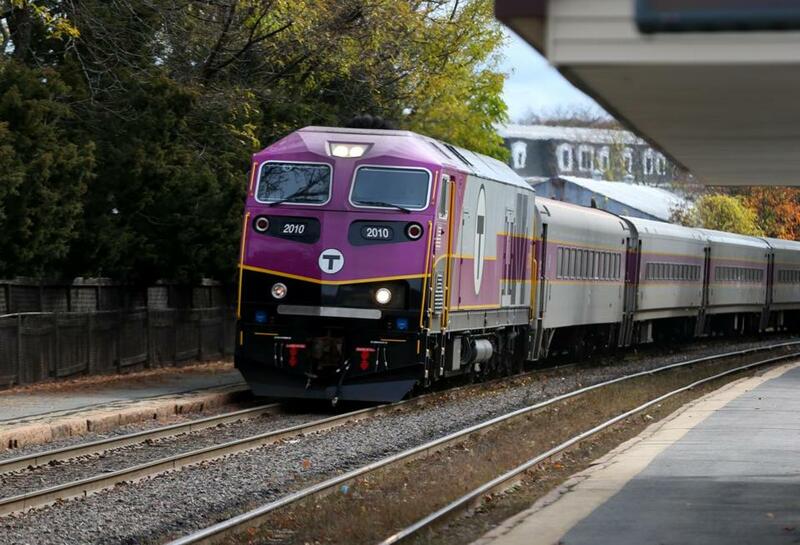 Still, in December and January, more than 1 in 10 trips on the commuter rail were more than five minutes late. The same Friday as the truck incident, the MBTA slapped Keolis with a $1.6 million fine, permissible under its “no-excuses” contract, following an $804,000 fine issued in November. Around $434,000 each month was for its poor on-time performance (the rest was for cleanliness of the cars and other issues). All this was before the weeks of snow woe in late January and early February, which exposed the aging infrastructure of the entire system, causing widespread delays and cancellations — and helped lead to the resignation of MBTA general manager Beverly Scott and pointed criticism of Keolis from Governor Charlie Baker. Prior to the snowstorms, Keolis officials contended things were improving. Franck Dubourdieu, who directs quality and performance improvement for Keolis in Boston, said the company was on track to hit 92 percent overall on-time performance in January. The January 28 storm shot that, but Keolis may receive a reprieve from being penalized for January’s on-time performance. “We’ll be better,” Dubourdieu said. “This year we can pick things up.” However, he notably stopped short of promising that Keolis would reach the 95 percent on-time performance it needs to avoid more fines. So why can’t we make the trains run on time? Can’t we learn from countries like Japan and Germany, where the trains usually are reliable? Perhaps. But it may be that trains, like Tolstoy’s unhappy families, fail for different reasons in different places. 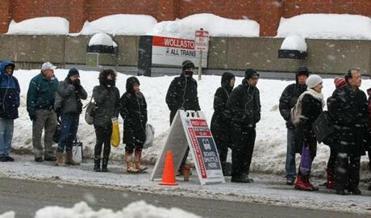 Commuters wait at the rail station in Belmont. AGING TRAINS ARE perhaps the most pressing problem. How many people do you know who still drive a Ford Pinto or any other 1970s-era hot seller? And, yet, while trains are built to last for 25 to 30 years, including refurbishment, some of the MBTA’s 84 active locomotives are pushing 40. The MBTA was supposed to get help in the form of 40 new semi-custom diesel-electric hybrid MotivePower locomotives, called HSP 46s, designed for the commuter rail. But since the first one arrived in 2013 and entered service in April 2014, only seven more have hit the rails. In January, the MBTA, prodded by the Globe, revealed that all had been recalled to have a ball-bearing issue fixed. These engines, which cost almost $6 million apiece, are undergoing repairs in Altoona, Pennsylvania, and at a maintenance facility in Worcester. While the MBTA vows it will certify at least three new engines each month this year, putting them all in service by December, it does not have the best track record and was publicly saying these trains were being tested even though it knew they were going to be delayed. And it’s still getting Hyundai Rotem passenger cars in service — the last of the 75 new cars will be approved this month, some three years late. 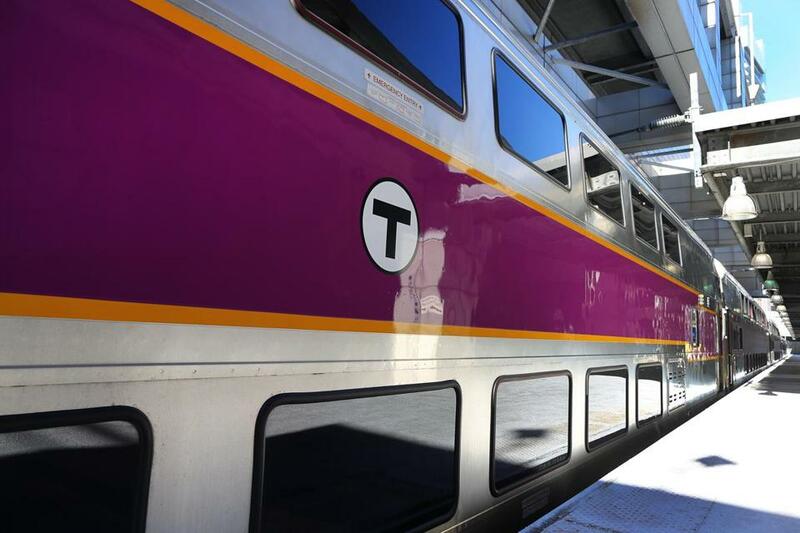 Keolis executives haven’t pointed fingers yet, but they do note that their expectation was that the MBTA would make sure that the new locomotives were available by now. In the meantime, the aging fleet has had significant issues. While the MBTA’s stated goal is for locomotives to run 10,000 miles between mechanical failures, it hasn’t made that mark in more than a year. October was one of its worst months, with an average of 3,193 miles between failures. Ultimately, the new, faster locomotives will be able to shave time off of commutes and perhaps make up time when things block the tracks. But the locomotive pulling the 1:15 from Boston to Fitchburg is one of the oldest in the fleet, with only three out of four working “traction motors’’ to drive the wheels. That means during the sections of rail that have a top speed of 79 miles per hour, this train won’t be able to reach much more than 70. 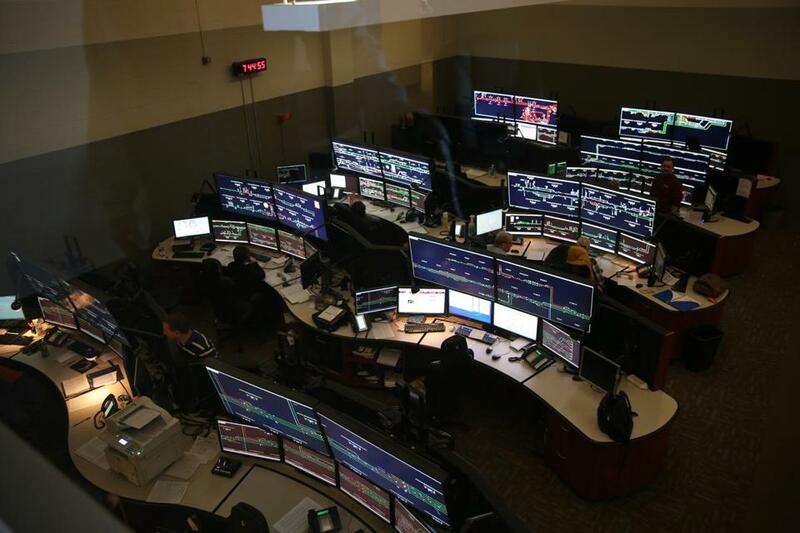 Screens in the MBTA control room help monitor the trains. The next obstacle facing today’s 1:15 to Fitchburg is that there is only one track open. Just as highway construction often means lane closures, railroad work can see two tracks reduced to one, creating a choke point. Speeds are restricted in work zones for trains, just as for cars. A big reason for the Fitchburg Line’s issues is an ongoing three-year, $277 million upgrade. Rails and bridges are being replaced, curves straightened and smoothed, signals improved, and new stations are being built in Littleton and South Acton. When the work is done, slated for the end of this year, the upgrades will create more stretches of rail where the trains can go as fast as 79 miles per hour in areas where speeds now are sometimes limited to 30. That will mean riders should save 10 full minutes on the express between South Acton and Boston. But, for now, all the work means that for long stretches one of the two tracks that run between much of Boston and Fitchburg is out of service. In Concord, the MBTA is replacing or rehabilitating three bridges — over the Assabet River, Route 62, and the Sudbury River. Our 1:15 to Fitchburg might otherwise be switched to the inbound track and bypass the truck accident, but it can’t, because there’s only one track operating through Concord. If a train gets backed up, for whatever reason, that can ripple through the whole system. Commuters on the Franklin, Fairmount, and Providence/Stoughton lines also ran into this on December 31, when an Amtrak signal near the Readville stop failed around 7:15 a.m. near a point where the inbound and outbound tracks merge into a single track. Because trains from three commuter lines, plus Amtrak, use that single rail to get in and out of Boston, the entire morning commute was disrupted, even though the signal was repaired fairly quickly. Freight trains also run on all the rails used by the commuter rail, though they no longer take priority over commuter trains. The map shows where a three-year, $277 million upgrade along the Fitchburg Line is adding track and replacing bridges. The project should be completed by the end of the year. This January day, at least, the riders and Keolis catch a break. It turns out that the “rollover’’ is actually just a truck that jackknifed, which is much easier to correct. The 1:15 loses a few minutes coming into Concord, but despite its less-than-stellar engine, it is able to make them back and gets into Fitchburg just a couple of minutes after 2:49 p.m., when it is supposed to arrive. Keolis gets a 4-minute, 59-second grace period before it is fined for being late, so this trip counts as on time. BESIDES TIRED TRAINS and track work, there is, of course, the weather. Freak snowstorms of epic magnitude aside, trains also dislike two things that may surprise people: high temperatures and leaves. In the summertime, Boston commuters on the Framingham/Worcester Line gripe about speed restrictions on days that don’t seem overly warm, around 85 degrees. As @grokette tweeted: “heat-related speed restrictions? Hey boss, I’m coming in late today because this heat is just killing me!” Heat restrictions are an unintended side effect of engineering advances. Tracks formerly were laid in 39-foot sections of steel rail, kept in place by spikes and joints. (Trains delightfully went clickety-clack because their wheels hit the joints every 39 feet.) Now trains whir, because they run over rails that are laid in quarter-mile lengths and welded together, with clips holding them in place. These longer, unjointed rails provide a smoother ride and are easier to maintain. But all rails contract in cold weather and expand in hot weather, and when that expansion is taking place over a quarter-mile ribbon of steel subjected to the force of hundreds of tons of train, it can cause the rails to kink or buckle, which can, in turn, derail a train. The MBTA has a three-part rail therapy project that will resume in March to “de-stress’’ rails between Boston and Worcester. De-stressing involves heating the rails section by section to between 100 and 120 degrees, then re-clipping them so they can better handle expansion at high temperatures. 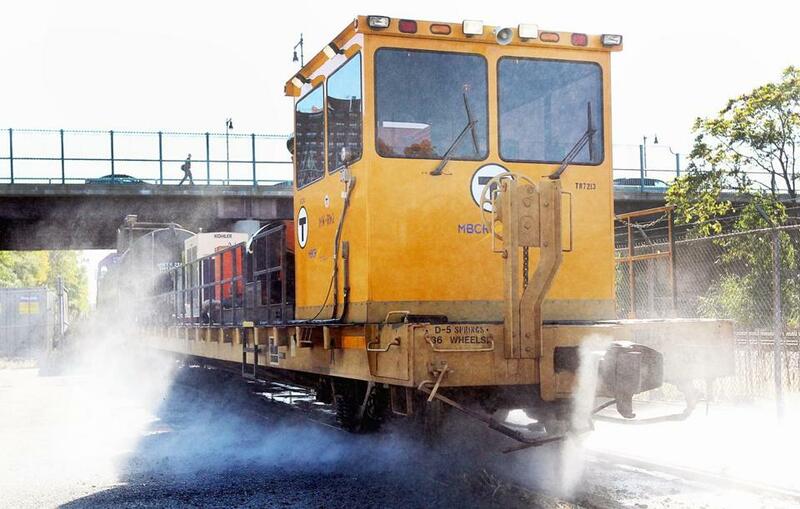 The work will still be going on this summer, but next year’s commutes should see heat restrictions eliminated except for the rare days Boston temperatures exceed 90 degrees (a safety precaution, since engineers can’t be sure all the rail reaches more than a 90-degree temperature during de-stressing). 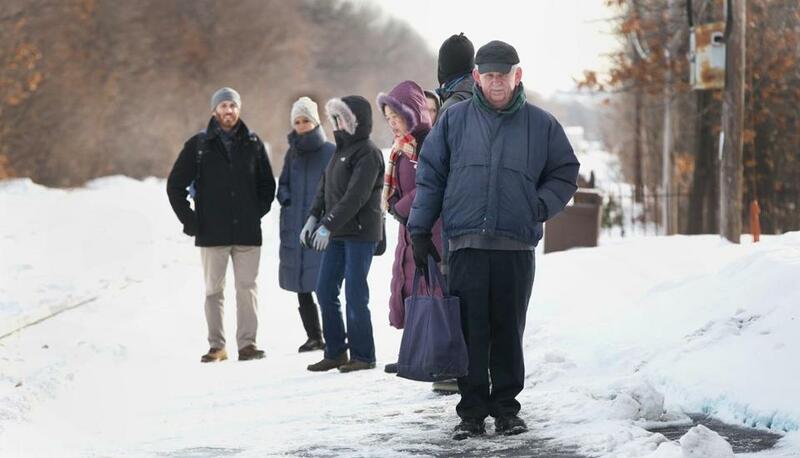 More vexing for commuters is fall, better known as #slipperyrail season. Trains, unlike cars, don’t have tread to create traction, and rubber on asphalt is far less likely to slip than steel on steel. Trains running over leaves crush them and deposit a slick film on the rail, making it hard to stop and start or go uphill. “The wheels just spin and spin. It’s like trying to drive a car on ice,” says Melanie Rines, an engineer for Keolis, who says that fall, rather than winter, is typically the most challenging time to drive a train. A power washer cleans the leaf slick rails. STILL, THERE ARE MBTA lines where the trains mostly run on time. While the Fitchburg and Newburyport/Rockport lines can get mired below 70 percent on-time rates, the Fairmount and Greenbush lines often run at better than 95 percent on-time rates. What’s the difference? Mainly, newer infrastructure. Franck Dubourdieu’s job for Keolis puts him in the on-time hot seat. Boston isn’t nearly on the same scale as other cities he’s managed: In Paris, he ran a line that carried 600,000 people a day versus the commuter rail’s 130,000 riders. That line in Paris shared a tunnel with another line; during peak hours, 32 trains ran each way through the tunnel, or more than one per minute. WHAT WOULD MAKE THE TRAINS RUN ON SCHEDULE? Here are six things we could do to dramatically reduce rail delays, listed largely by cost (think of this as a dream list that goes from least likely to most likely). A two-phase project is slated to repair the commuter-rail drawbridge in Beverly. 1. Upgrade stations and rails: If all the MBTA’s stations had high-level platforms, like the one at Yawkey Way, commutes would be faster. That’s because these platforms, built 4 feet off the ground, mean train doors open automatically. There’s no need for conductors to raise and lower steps, and there are no restrictions on which cars commuters can enter (a train might carry six passenger cars, but a maximum of four conductors and assistant conductors). 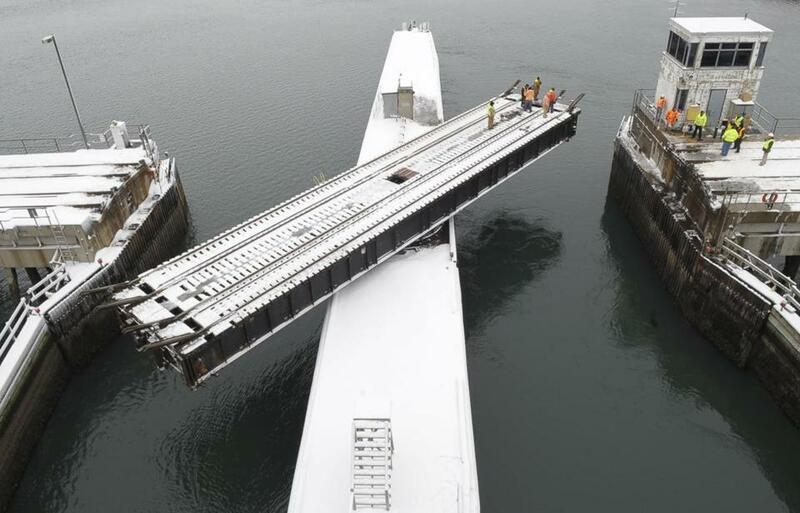 MBTA officials estimate that this alone could shave a minute per stop off a commute. Here’s the catch: The new high-level platforms at South Acton and at Boston Landing will cost $20 million to $25 million to build. Adding such platforms at some stations would require tracks to be moved as well. That’s a lot of money per minutes saved. Repairing the cranky drawbridge in Beverly, a project that just started taking bids, will help the Newburyport line. Adding double tracks between places like Waltham and Boston will bring improvements in speed and lessen jams if a train breaks down. But track costs about $1.5 million per mile, not counting signals and other support infrastructure. New infrastructure contracts often involve lawsuits from aggrieved losers, which drag things out and make them more expensive. 2. Add new trains and passenger cars: If Boston had its new fleet actually running, there would be far fewer delays due to breakdowns and routine maintenance. Sadly, adding new engines and rail cars in the real world carries none of the ease of enlisting the help of Sir Topham Hatt to order up new friends for Thomas. It takes months to bring new engines and rail cars online, at least for the MBTA, which has a history of, in fact, needing years to bring new passenger cars into service, and so far is doing little better with its new engines. These aren’t cheap, either, with the MotivePower locomotives costing $5.55 million apiece and the Hyundai Rotem passenger cars about $2.5 million each. For both the locomotives and the Hyundai Rotems, the MBTA bought new models, meaning it took longer to test for things ranging from emissions to software compatibility. Contracts for new trains and cars also suffer time-consuming lawsuits; MotivePower won its deal after a successful challenge reversed a loss. 4. Educate: The United States has almost no university-level education targeted at managing and operating railroads, with most of such programs disappearing in the 1950s and 1960s. The demise of passenger railroad companies like the Boston & Maine and Boston & Albany meant a loss of practical expertise, as well. Germany has 14 such programs, and other European and Asian nations also offer more extensive education for railroad management. “All over Europe, when they teach operations, a lot of the universities use a gigantic model railroad that is operated with real traffic control equipment,” says Tom White, the consultant. He says the return of graduate programs in railroads at the University of Illinois at Urbana-Champaign and the Michigan Technological University is a step in the right direction, but it will take a long time to replace lost knowledge. A new hybrid MotivePower locomotive. 5. Institute smarter management: Keolis officials believe that they can apply techniques used in European railroads and in other industries to wring small, steady improvements out of operations that will lead to better on-time performance. For instance, Keolis saw that many trains left late and has worked aggressively to get conductors not to hold doors for passengers to reinforce the message that the trains need to leave on time. Its analysis also showed that one delayed train could hold up multiple trains, creating a cascading effect, and reset dispatcher priorities so that on-time trains get priority. They are also looking at remodeling the whole system and updating how trains are routed. 6. Get realistic: Franck Dubourdieu argues that there are effectively two seasons for trains: winter and not-winter. Track maintenance can only happen in not-winter, and, as with roads under construction, that means slower travel times. Keolis may ask to introduce European-style dynamic scheduling — schedules that change seasonally to account for the weather, say, allowing extra time in summer. One of the Hyundai Rotem passenger cars. The goal is 95 percent.